I'm Tim Yao, aka NewMexicoKid, co-Municipal Liaison for the Illinois::Naperville region of National Novel Writing Month and founding member of the Journey, our year-round writing group that has published its own short story anthologies. 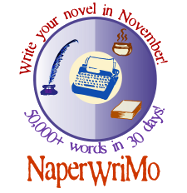 With firebus, I helped develop the original wordcount API (wcapi) for NaNoWriMo. NaperWriMo home, blog, wiki, and shop. NaNoWriMo hipster PDA - I introduced the the NaNo hipster PDA to the ML community in 2005.